We had a fabulous time at the Dassault Systèmes Community of Experts COE 2018 Annual Experience and TechniFair earlier in April. It’s always refreshing to get out of the office and meet up with colleagues and customers. We enjoy the networking opportunities and chances to collaborate with DS users. We had good participation at our two presentations. If you attended COE, you have access to the slides. If you weren’t able to make it to COE, let us know and we’ll send the presentation slides to you. Both presentations elicited smart questions – we enjoyed the dialogue. In this presentation, I reviewed the difference between configurations and customizations in 3DEXPERIENCE (aka ENOVIA). The audience appreciated the demo of how to develop a 3DEXPERIENCE customization via JPO code, enable it in 3DEXPERIENCE and test it. You can read more about customizations in our blog post The Value of Customizations in PDM/PLM Implementations. We discuss how customization allows enterprises to add their own unique business flavor and processes that are exclusive and beneficial just to them…which aren’t always included in an out-of-the-box PLM system. We had a good Q&A discussion about where the customization code will run – either on the client side, i.e., on the web browser running 3DEXPERIENCE or on the server side, i.e., on the server where 3DEXPERIENCE is installed. We also discussed how best to handle a customization during upgrades and how to check for API deprecation from Javadoc documentation. Dassault provides Javadoc installation media. When you navigate to the particular API class, you will see the deprecated method information. Data migration projects can be quite complex – more than just saying I want the data in system X to show up in system Y. 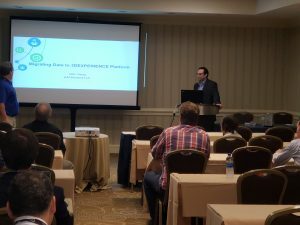 In this session, I detailed what is involved and which issues need to be considered when planning and implementing a data migration to 3DEXPERIENCE. I included specific considerations and technological tips to ensure a successful migration. We were asked about using Adaplet technology. (Adaplets enable implementers to virtually model and access any external data source and represent it in the 3DEXPERIENCE platform as if it is native ENOVIA data.) While it is not officially supported, it is a method to load a large amount of data very quickly. We also talked about XPDM technology, which is like a toolbox of methods for loading data in different ways. It can convert CATIA V5 data to CATIA 3DX. The technology creates mapping elements to map the various data structures to be loaded into the 3DEXPERIENCE data model. However, the mapping elements and data objects get created within 3DEXPERIENCE and grow large in size, so you many need another method to delete or remove them after the migration. At xLM Solutions, we have performed migrations from various sources (legacy/migration from) to a variety of destinations (new/migration to). Our migration projects have ranged from straightforward, vanilla migrations to extremely complex ones involving whole business transformations. We spell out some of the most important considerations in 6 Things to Consider Before Starting a Data Migration Project. Save the date for the COE 2019 Annual Experience & TechniFair, February 24-27, 2019 in New Orleans. Contact xLM’s team of experts today.